Should people be fined for texting while walking? One US city will discuss such a law. 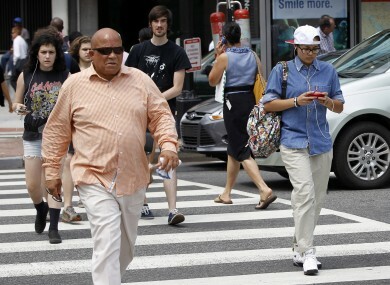 AN AMERICAN CITY could fine or even jail people who text or look at their phones while walking. Experts say distracted walking is a growing problem around the globe, as people of all ages become more dependent on electronic devices for personal and professional matters. They also note pedestrian deaths have been rising in recent years. 11%t of all US road fatalities in 2005 involved pedestrians, but that number rose to 15% in 2014. The rise in deaths coincides with states introducing bills that target pedestrians and/or bicyclists. For instance, a bill pending in Hawaii would fine someone $250 if he or she crossed the street with an electronic device. The measure recently introduced by New Jersey Assemblywoman Pamela Lampitt would ban walking while texting and bar pedestrians on public roads from using electronic communication devices unless they are hands-free. Violators would face fines of up to $50, 15 days imprisonment or both, which is the same penalty as jaywalking. Lampitt said the measure is needed to dissuade and penalise “risky behavior.” She cited a National Safety Council report that shows distracted walking incidents involving cellphones accounted for an estimated 11,101 injuries from 2000 through 2011. The study found a majority of those injured were female and most were 40 or younger. Talking on the phone was the most prevalent activity at the time of injury, while texting accounted for 12%. Nearly 80% of the injuries occurred as the result of a fall, while 9% occurred from the pedestrian striking a motionless object. The most common injury types included dislocations or fractures, sprains or strains and concussions or contusions. A hearing on the proposed New Jersey measure has not been scheduled. What do you think? Should people be fined for texting while walking? Email “Should people be fined for texting while walking?”. Feedback on “Should people be fined for texting while walking?”.